Hill and Wang, 9780374523145, 272pp. America's cities are being rapidly transformed by a sinister and homogenous design. A new Kind of urbanism--manipulative, dispersed, and hostile to traditional public space--is emerging both at the heart and at the edge of town in megamalls, corporate enclaves, gentrified zones, and psuedo-historic marketplaces. If anything can be described as a paradigm for these places, it's the theme park, an apparently benign environment in which all is structured to achieve maximum control and in which the idea of authentic interaction among citizens has been thoroughly purged. 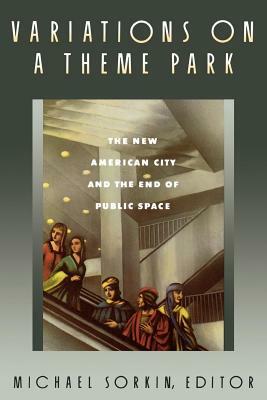 In this bold collection, eight of our leading urbanists and architectural critics explore the emblematic sites of this new cityscape--from Silicon Valley to Epcot Center, South Street Seaport to downtown Los Angeles--and reveal their disturbing implications for American public life. Michael Sorkin is an architect and urban planner, and the author and editor of many books, including All Over the Map, Against the Wall, Exquisite Corpse, and Variations on a Theme Park (Hill and Wang, 1992). He lives in New York City.